Knowing what your operations are up against is crucial in preventing costly, potentially dangerous, damage. There have been many studies about the cost of corrosion. NACE International, formerly known as the National Association of Corrosion Engineers (nace.org, Houston), conducted research from 1999 to 2001 that found direct corrosion costs in the United States amounted to $276 million (about 3.2% of the country’s GDP). In March 2016, NACE released a study that estimated worldwide corrosion amounted to $2.5 trillion (about 3.4% of the GDP) and indirect costs doubled that. In the 2016 study, NACE estimated that between 15% and 35% of those corrosion-related costs could be eliminated using current technology. Researchers also offered that, comparing corrosion costs in 1975 with those in 1999, an intelligent approach to automobile design and elimination of corrosion appeared to have reduced the cost to American consumers by about 52%. Energy is needed to convert mined ores into useful metals. Corrosion is the natural result of those metals trying to revert back to their original states. Consider, for example, that there’s very little difference between the rust from corroded steel and the iron ores that were originally refined to make that steel. Fig. 1 Depicting a steel bar in liquid, this diagram shows how corrosion occurs. The liquid contains water. When iron ions (Fe) off the bar unite with oxygen in the water, different kinds of rust can form. he actual corrosion process is an electrochemical reaction. Depicting a steel bar in a liquid, Fig. 2, shows how this reaction takes place. In the diagram, corrosion is attacking the anode, with iron ions being released into the solution, while hydrogen is being generated at the cathode. Water (H2O), is made up of two hydrogen ions and one oxygen ion. The iron ions from the anode (the Fe symbols) will ultimately unite with oxygen in the water, whereupon several different types of rust can form. At the cathode site of the piece, atomic hydrogen is being released. Most of those hydrogen ions then mate with another hydrogen ion and form molecular hydrogen, the readily flammable gas we’re used to thinking about. But some of the ions remain solitary and they are the cause of the many forms of hydrogen damage including hydrogen embrittlement, cracking, and blisters. For wet corrosion, a liquid must be present to provide the complete circuit required by the electromechanical reaction. Electrons that flow from the cathode to the anode have to eventually return to the cathode, and they do so by traveling through the liquid. Chemicals such as road salt are in the silt. As the moisture in it evaporates, the chemical concentration increases. The chemicals, in turn, make the water more electrically conductive and significantly increase the rate of corrosion. Temperature is a third important factor in corrosion. Below freezing, ice can’t conduct corrosion currents. But, as the temperature increases, the corrosion rate increases. A good example is the rapid attack on hot piping with moist insulation. The exact solution chemistry has a major effect, but up to about 175 F (80 C), the corrosion rate usually rapidly increases, then drops off and ceases when the liquid vaporizes. Uniform corrosion causes about 80% of all corrosion. It occurs where anode and cathode sites relatively uniformly swap position. Examples include the railroad-bridge-support column shown in Fig. 1, buried steel water lines, nooks and crannies on vehicles where deposits build up, and machine frames and bases in damp areas. Pitting corrosion manifests as isolated areas of attack. With carbon steel, it may take years before leakage occurs while stainless-steel pitting might progress at a rate of 0.001 in. (0.025 mm)/day. Steel examples frequently include water and wastewater tanks. Stainless-steel examples include external areas with dirt deposits on them. Galvanic corrosion occurs when two chemically different metals are joined. One is always the anode and continuously attacked, protecting the other piece. A common example involves a joint between steel and copper pipe, where the steel will always be attacked. Fig 2. A common example of galvanic corrosion involves a joint between steel and copper pipe where the steel will always be attacked. This joint was submerged in water for only nine months before damage occurred. 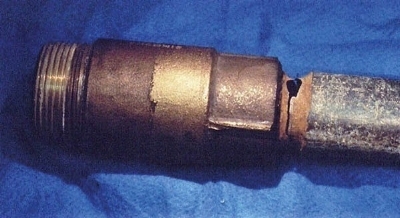 Figure 3 shows a bronze fitting and a steel pipe that had been submerged in water. Perforation of the freshly cut pipe threads happened in only nine months. Crevice corrosion occurs in a small gap between two pieces of metal. It allows a corrosion mechanism to act in a way that’s similar to pitting corrosion. 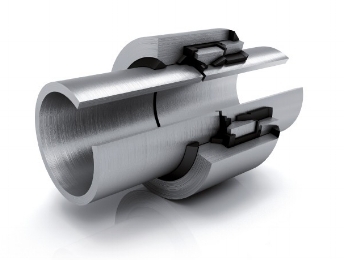 Although it’s not a common industrial mechanism, it can happen with poor joint control on welded assemblies. Intergranular corrosion involves galvanic attack at the grain boundaries within a metal. It’s usually associated with a poor choice in materials of construction for chemical processes. Erosion corrosion is a combination of actions. Corrosion results in an oxide on a metal’s surface. The oxide, though, slows the attack because it prevents fresh corrodent from reaching the surface. If there’s a fast fluid flow that scrubs the oxide off the surface, corrosion continues at a very rapid rate. A common site for erosion corrosion is the outer radius of piping elbows in steel lines with untreated waters and flow rates exceeding approximately 10 ft./sec. (3 m/sec). It’s also been seen in pumps as a result of poor choices of construction materials. The previous seven categories/types are basically different-looking versions of galvanic corrosion. Two other corrosion types—stress-corrosion cracking and hydrogen damage—result in metallurgical damage leading to often hard-to-detect catastrophic failures. Stress corrosion cracking (SCC) can occur with almost any metal and is the result of a combination of stress, a chemistry that attacks the metal’s structure, and a susceptible metal. Industrially, although it is sometimes seen with nitrates and steel, the most common situation involves 300 series (austenitic) stainless steels and chlorides. The battle against corrosion is never ending. In summary, if an area is wet and metal isn’t protected, there will be corrosion. What’s worse, the seriousness of the damage caused by this scourge may not be recognized for years.